I only had a short time for stitching, but it has brought me to the end of the third page. The foliage has been started at the top right, and this can only mean I'm coming to the end of the whole piece. I can now turn over to the last page. 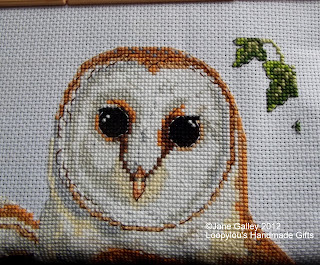 This is about a third of the size, so all being well, the stitching part of this project might soon be over. Well done..it will be stunning when it is finished! It is always good to see the end of a project is near. I always like the 'light at the end of the tunnel' phase of a project. There's a lot of stitching here and still more to go, but you can feel the finish on its way! You are doing such a wonderful job on this one! Your owl is just stunning! I do not do counted cross stitch, so I really admire that you are making such a beautiful fellow! This end has been a long time coming. It's lovely! Just look at that little face - so realistic! !